Why and How Solubility and Crystallization are Crucial for Bio-Fuels? The global concern towards greenhouse gas emissions and their impact on the environment has led to an increased use of sustainable, bio-derived feedstocks in fuel oils. The target set by the European Union for 2020 reflects that 10% of biofuel will be shared in transport as a blend component with the traditional fossil oil . According to Aatola, this second generation of biofuel has been intensively investigated by the EU due to its advantages regarding its compatibility with diesel fuel and its boost fuel properties . Nevertheless, the high crystallization temperature of the long chain alkanes within the fuel makes it undesirable. The high molecular weight alkanes become supersaturated during cooling, which results in the precipitation of less soluble flat plate-like wax crystals. These can aggregate together and form an impermeable mass that can melt together and block a vehicle's fuel filter. Eventually this directly impacts the operation of vehicles in cold climate regions. Conventional additives can inhibit nucleation and partly destabilize the fast-growing faces of these wax crystals and produce more compact habits in which the crystals are usually tabular in shape and reduced in size, respectively. Tang et al recently published the results of their comprehensive studies related to the solubility of HVO blended diesel fuel [3-4]. Their findings brought fundamental knowledge on activity, solution saturation temperature, and MSZW. 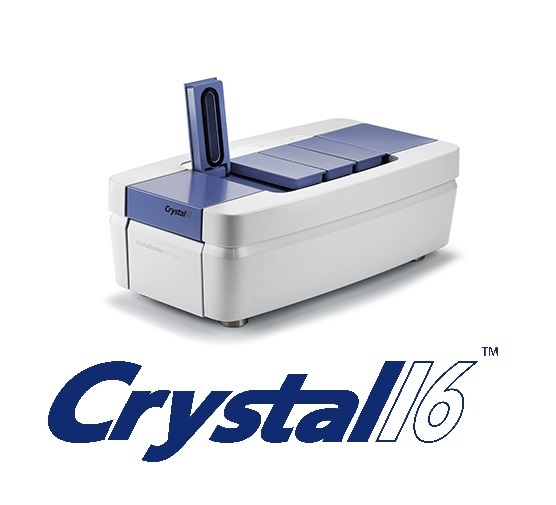 By making use of the Crystal16 instrument, the authors were able to easily perform the solubility and crystallization experiments in an efficient and reliable way. This instrument comprises sixteen reactors that are split into four blocks, consisting of four reactors each. Each block is independently temperature-controlled to allow different temperature profiles to be set simultaneously. Each reactor can hold a magnetically stirred 1 mL disposable glass vial. 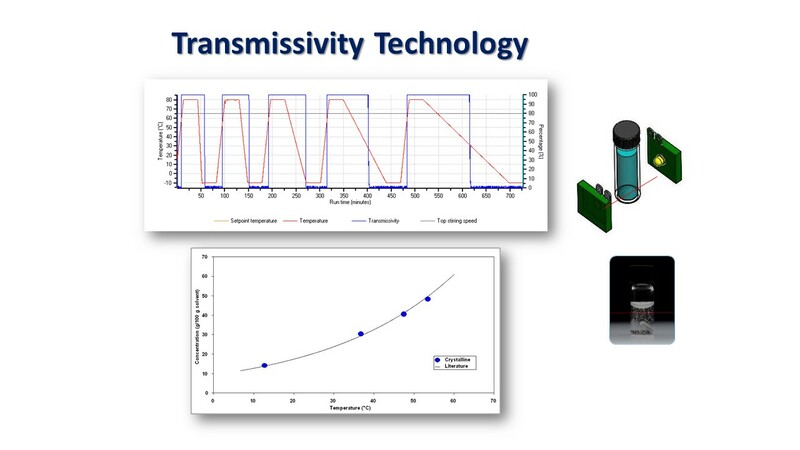 The transmissivity technology available on the instrument, provided the necessary information about the cloud (crystallization) and clear (solubility) points of up to 16 solutions at once as a function of the temperature. Their data reveals the existence of more soluble, less stable crystal structures that form from the alkane mixtures. An increased carbon chain length results in lower solubility for all the investigated solvents and the solvent type is not found to have any significant effect on the solid forms produced from the mixtures. Nevertheless, the van’t Hoff analysis revealed that the solvent type influences the solute solubility with the closest to ideal behavior being dodecane followed by kerosene and toluene, respectively. Their measurement of crystallizability as a function of solute composition and solvent were found to mirror the solubility data as evidenced by a high dependency of the measured MSZWs on the known solid form formation behavior, the composition and solution effects. The high need of fundamental knowledge on the crystallization behavior of blended HVO/diesel fuels and the findings of Tang et al are certainly contributing to a better understanding and an increased use of sustainable, bio-derived feedstocks in fuel oils. 1. Sorda G, Banse M, Kemfert C. An overview of biofuel policies across the world. Energy Policy 2010;38(11):6977–88. 2. Aatola H, Larmi M, Sarjovaara T, Mikkonen S. Hydrotreated Vegetable Oil (HVO) as a renewable diesel fuel: trade-off between NOx, particulate emission, and fuel consumption of a heavy duty engine. SAE Int J Engines 2008;1(1):1251–62. 3. Xue Tang, Peter L. Kaskiewicz, Diana M. Camacho Corzo, Xiaojun Lai, Kevin J. Roberts, Peter Dowding, Iain More, Solubility and crystallisability of the ternary system: Hexadecane and octadecane representative in fuel solvents, Fuel 226 (2018), 665-674. 4. Tang X, Kaskiewicz PL, Camacho Corzo DM, Xiaojun Lai, Kevin J. Roberts, Peter Dowding, Iain More. Data for crystallisation, dissolution and saturation temperatures of the ternary system: Hexadecane and octadecane representative in fuel solvents. Data Brief. 2018;19:1382-1392. Published 2018 May 31.